The Sazerac cocktail was named by John Schiller in 1859 upon the opening of his Sazerac Coffee House in New Orleans. Both most likely derive their name from a popular brand of Cognac, Sazerac-de-Forge et Fils. 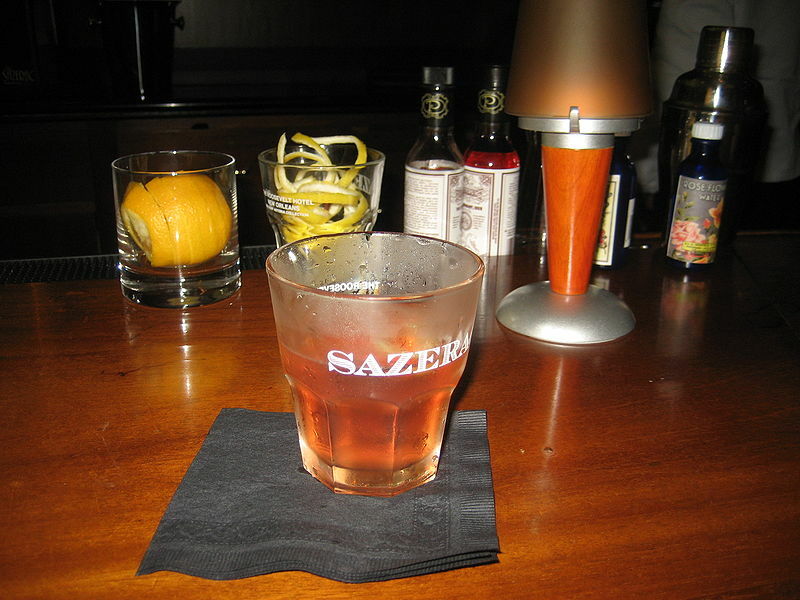 The original Sazerac Cocktail was a cognac based drink. In the 1870s, cognac was replaced with Rye Whiskey, and absinthe was added. Some modern recipes do, however, retain some amount of cognac. The Sazerac is New Orleans' official cocktail. One old fashioned glass is packed with ice. In a second old fashioned glass, a sugar cube and 3 dashes of Peychaud's Bitters are muddled. The Rye Whiskey is then added to the sugar/Bitters mixture. The ice is emptied from the first old fashioned glass and the Absinthe is poured into the glass and swirled to coat the sides of the glass. Any excess Absinthe is discarded. The Rye-Sugar-Bitters mixture is then poured into the Absinthe coated glass and the glass is garnished with a lemon peel. The cocktail is served neat; undiluted and without ice. According to the Sazerac Company of New Orleans, the modern day Sazerac Cocktail recipe calls for 1 cube of sugar, 1 1/2 ounces of Sazerac Rye Whiskey, 1/4 ounce of Herbsaint, 3 dashes of Peychaud's Bitters and a lemon peel. One old-fashioned-Western-style glass is packed with ice. In a second old fashioned, Western-style glass, a sugar cube and 3 dashes of Peychaud's Bitters are muddled. The Rye Whiskey is then added to the sugar/Bitters mixture. The ice is emptied from the first old-fashioned-Western-style glass and the Herbsaint is poured into the glass and swirled to coat the sides of the glass. Any excess Herbsaint is discarded. The Rye-Sugar-Bitters mixture is then poured into the Herbsaint coated glass and the glass is garnished with a lemon peel.